December 17 is actually an important day in history. Know what it is? The first real, successful flight of a powered heavier than air aircraft. 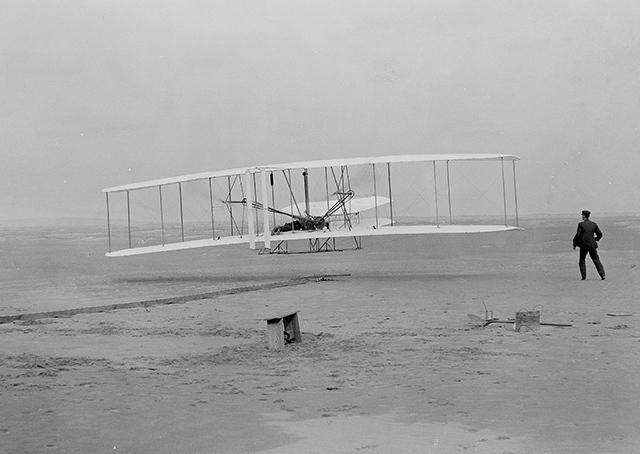 The Wright brothers day where they tested their flying machine which would become known as planes, aircraft, airplanes, ufos, etc. Its truly amazing how far the science of flying has come in such a short amount of time. There have been many failures, but you can’t have success without failure. Many times those failures spurred success. The names of many who tried to fly and failed are lost to history, but the Wright brothers finally managed to succeed because they failed to give up. The iconic image of Orville Wright’s first flight with Wilbur running alongside the right wing as the craft broke earth’s gravity near Kitty Hawk, North Carolina, almost didn’t happen. Coast Guardsman John T. Daniels was thrust into the limelight when he was tasked with operating Wilbur’s boxy Korona-V glass-plate camera to document the Wright brothers flight into history Dec. 17, 1903. Photo by John T. Daniels.